Suddenly, the shadowy figure behind Zero Hedge was a full-blown cult hero—a blogger with a bullet. His readership of angry traders and anti-government malcontents celebrated his newfound power. “Welcome to the party pal!! !” declared one of his fans in the comments section. In a sign of just how radically the order has shifted in the political and media world, neither the Times nor Schumer had a clue about the identity of the pseudonymous author behind Zero Hedge. As it happens, the founder is a 30-year-old Bulgarian immigrant banned from working in the brokerage business for insider trading. A former hedge-fund analyst, he’s also a zealous believer in a sweeping conspiracy that casts the alumni of Goldman Sachs as a powerful cabal at the helm of U.S. policy, with the Treasury and the Federal Reserve colluding to preserve the status quo. His antidote? A purifying market crash that leads to the elimination of the big banks altogether and the reinstatement of genuine free-market capitalism. Never mind Dow 10,000. Dan Ivandjiiski is all about Dow Zero. Last year’s financial implosion left the investing public deeply unsettled about who or what to trust. The information that flowed from the banks, the ratings agencies, the regulatory agencies, and the mainstream media—the bedrock of the financial markets, in a sense—was viewed with great suspicion, and that created an opportunity for financial bloggers: a motley assortment of amateurs and professionals from all over the map. There are traders, economists, venture capitalists, financial advisers, and pajama-clad cranks all vying to explain the complex machinations that got us into this mess and to critique governmental solutions. Sites like Naked Capitalism, Seeking Alpha, the Big Picture, Infectious Greed, Angry Bear, Calculated Risk, and Zero Hedge have hatched communities based on discontent and disbelief, forming a kind of ragtag insurgency against the financial Establishment and what they view as its feckless lackeys in the government and media. “We’re all happily cruising along, doing our financial-journalism thing, until late 2007,” explains Felix Salmon, who now blogs for Reuters. “We have relationships with flacks, and suddenly they started lying to us. Outright lies. And you’re like, ‘Wait, that’s not kosher, you can’t do that.’ ” Among bloggers, Salmon is more of the Establishment type, with little tolerance for the sloppy thinking of excitable bloggers. Financial blogs grew out of the message boards launched by Yahoo! Finance in the late nineties, which were primarily a forum for day traders to argue investment ideas and vent little-guy frustrations about the Wall Street power structure. In the years that followed, blogs proliferated. They were mostly side projects, updated sporadically. Ritholtz, who started the Big Picture in 2003, was a market strategist who zeroed in on flaws in the government’s inflation data. Calculated Risk was started by a retired businessman in Southern California who took an obsessive interest in exotic mortgages and saw the housing collapse years in advance. 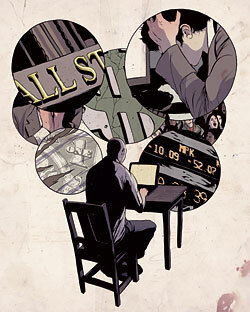 Naked Capitalism, which features the work of a small gang of contributors, is overseen by a former Goldman Sachs and McKinsey executive who goes by the pseudonym Yves Smith. Early on, the readers of these blogs seemed to be a relatively small and disparate group—a smattering of day traders, academics, and people who worked in and around the edges of the financial industry. They were “gold bugs” and “dollar bears” united by their hostility to Wall Street and their conviction that the U.S. economy was heading off a cliff. When Bear Stearns blew up, the bearish view was validated and these blogs gained credibility with a larger audience. Amid the chaos on Wall Street, they found themselves with much greater influence than they’d ever imagined possible. Such is their power today that the Treasury and Federal Reserve both circulate “blog watch” e-mails, which are sent to the White House every day. Aides on Capitol Hill solicit bloggers for advice and explanations on complex regulatory issues, according to government spokespeople and the bloggers themselves. When John Hempton, whose blog is called Bronte Capital, wrote a massive post on the Treasury Department’s banking-reform plan—meticulously noting the government’s poor judgment in assessing the solvency of banks—“I went from having ten readers in Washington to 700,” he says. Out of this scrum, Zero Hedge would distinguish itself as one of the most enterprising and the most combative, although not right away. The site was launched in January of this year, a few days after Dan Ivandjiiski, who lives on the Upper East Side, lost his job at Wexford Capital, a Connecticut-based hedge fund run by a former Goldman trader. Blogging may seem like an odd career shift for a well-paid hedge-fund analyst, but for Ivandjiiski, it marked something of a return to the family business: His father, Krassimir Ivandjiiski, is a writer and editor at Bulgaria Confidential, a tabloid known for its controversial investigative reporting. In 1996, the elder Ivandjiiski exposed what he said was political corruption and drug trafficking in, of all places, Montana, in a story republished in the U.S. in a shoestring periodical called Free Speech Newspaper. Dan Ivandjiiski moved to the U.S. to study molecular biology at the University of Pennsylvania in preparation for medical school. After graduation, Ivandjiiski instead took a job as a junior investment banker at Jefferies & Company in Los Angeles, followed by a brief stint at Imperial Capital. In 2005, he moved to New York to work for the firm Miller Buckfire, where he was accused of personally buying shares in an airline company one day prior to the announcement of a major deal with his former firm Imperial. Though he made only $780 on the trade, an official probe was launched and Ivandjiiski was barred from working in the broker-dealer business. The ban forced him into the unregulated world of hedge funds, where he learned the inner workings of the kinds of high-stakes trading he’d soon be writing about. When he started blogging, Ivandjiiski billed himself online as “Tyler Durden,” after the masochistic anarchist played by Brad Pitt in the film Fight Club, who blows up the headquarters of major credit-card companies. The early iteration of Zero Hedge used free online software to publish a generic white page with the name ZERO HEDGE in red at the top, along with a quote from Fight Club: “On a long enough timeline, the survival rate for everyone drops to zero.” The site’s first post appeared on January 9 at 4 p.m., and it set the tone: “One can follow the daily creation and destruction of wealth simply by looking at the constantly shifting landscape in New York,” Ivandjiiski wrote, predicting that an “upcoming wave of ‘Page 6’–worthy scandals” that would disgrace Wall Street. At first, Ivandjiiski seemed intent on imitating the snarky, gossipy tone of Gawker and Dealbreaker, lampooning the financial disasters splashing across the papers, from Madoff to Citigroup. Zero Hedge posted several times a day, much of it toothless and not very interesting. Ivandjiiski seemed timid about revealing his own views. Nobody commented. The first post to elicit significant feedback was a “Risk-Free Profit Idea of the Day”: Buy barrels of oil and store them. But he slogged away, e-mailing his links to established bloggers, like the San Diego–based investor and doom enthusiast Paul Kedrosky, who blogs at Infectious Greed. If Zero Hedge got four comments, it was a great day. His early readers were day traders, many running their own private message boards and invite-only blogs. Commenters tended to be confrontational, poking holes in his lengthy arguments about the inevitable implosion of New York’s pension funds or how Citigroup’s stock was a bear-market bellwether: “You’re kind of a moron,” said one anonymous reader. By March, Zero Hedge was getting up to 40 comments a post. The blog’s inscrutability was part of its appeal. It had the feel of a financial insider leaking forbidden information. Some of it actually was proprietary. In May, Zero Hedge made several posts based on the research of David Rosenberg, who was then the chief economist for Merrill Lynch. Rosenberg’s views on the market were extremely bearish; he predicted a slow, protracted recovery and dismissed his bullish peers as pom-pom wavers. Merrill Lynch was peeved to see research that its clients paid handsomely for made available for nothing on a blog. Lawyers were dispatched, and the material was removed from the site. Zero Hedge’s popularity metastasized with its increasingly paranoid focus. “The greatest bait and switch of this generation in all its visual splendor,” he announced under the headline “The Amazing talf Bait and Switch,” describing how the government’s lending program could easily be gamed by banks and hedge funds. Other bloggers, as well as some of his own readers, evinced skepticism at his analyses, but a growing number felt he was expressing something they all felt. “The whole thing smells of rank conspiracy and blackmail,” said one reader. As the stock markets surged back to life in the spring, Ivandjiiski’s economic predictions only became bleaker. On April 11, Zero Hedge wrote “The Imminent Disinformation Schism,” a 3,000-word opus on the split between the “naïve, easily-manipulated, small-time mom-and-pop investors” and a rising new group of tea-party-style skeptics, “the forward-looking taxpayers, who see the upcoming budget-deficit fiasco, the Social Security Ponzi scheme, the Medicare/Medicaid debacle, the ridiculous underfunding in public and corporate pension funds, the rising city and state taxes, the shuttering factories, the rising unemployment, the plummeting American production base, the ‘seasonally’ upward-adjusted economic data coupled with consistently downward revised prior economic releases, the increasing savings rate and the multi-trillion discrepancy in consumer purchasing power. It was around this time that Federal Reserve chairman Ben Bernanke mentioned “green shoots,” the first tiny signs of economic recovery. The financial blogosphere savagely mocked Bernanke’s rhetoric, even as the stock market endorsed it by rallying. It was a sham, Zero Hedge maintained; the market was clearly being manipulated. But how? His report reverberated widely. Zero Hedge’s traffic spiked. Goldman Sachs spokesman Ed Canaday felt compelled to respond, calling some of Zero Hedge’s charges “untrue and offensive.” Which of course only inspired Zero Hedge to dig deeper. Bit by bit, Ivandjiiski pieced together a theory as to how the firm’s dominance of high-frequency computer trading, specifically so-called flash trades, enabled it to see other people’s trades moments before they were executed. Goldman used this information, alleged Ivandjiiski, to jump in and pinch off pennies in the price differences, a practice that he estimated could add up to millions of dollars a day. This, he decided, was how the firm was producing such huge profits so quickly after its near-death experiences in 2008. Zero Hedge made such a compelling case that mainstream-media reporters started paying attention. Ivandjiiski happily walked journalists through his theories in off-the-record conversations, becoming a trusted resource, especially for reporters at Bloomberg News, which published several stories riffing on Zero Hedge’s pursuits, starting with a July 7 report speculating on the misuses of high-frequency trading following the arrest of Sergey Aleynikov, a former Goldman Sachs computer programmer accused of stealing the firm’s codes. “Goldman Sachs Loses Grip on Its Doomsday Machine,” went a story by Bloomberg columnist Jonathan Weil. Later, Ivandjiiski, using his alias Tyler Durden, was interviewed on Bloomberg Radio. And so it goes with Zero Hedge. Four days after the Times story on high-frequency trading, Zero Hedge re-launched with a sleeker design and more advertising space, adding staff and posting phone numbers to “offices” in London and Zurich. Zero Hedge has seen its page views triple since July. It began selling $37 Zero Hedge T-shirts, modeled by a rumpled hipster in a green camouflage cap. The new logo looks vaguely like a Masonic symbol, and Tyler Durden’s posts now feature the image of Brad Pitt’s pummeled face from Fight Club, a glowering radical. But not necessarily from his revenue stream. In July, Zero Hedge joined Halogen Network, an online-advertising company, which has placed Delta Airlines and Forex Trading ads on the blog’s pages. Halogen plans on conducting a reader survey for the site in the coming month. Greg Shove, founder and CEO of Halogen, says it will likely show the same demographics as other successful financial blogs: men between 35 and 55 who make $200,000 and up a year—a pretty juicy target audience. Zero Hedge could potentially rake in $25,000 a month in ad revenue alone. That’s a pittance for someone accustomed to hedge-fund wages, but it’s a healthy foundation for a nascent web-publishing firm that’s less than a year old. Zero Hedge has certainly attracted high-powered readers drawn to his way of thinking. Jim Chanos, the founder of the investment firm Kynikos Associates, calls it a “must read” for his firm. A famed short-seller, Chanos is strategically sympathetic to Ivandjiiski’s radically bearish market views. Zero Hedge’s central argument, that the big banks are a menace and must be broken up, is “one that I and a lot of people secretly support,” says Chanos. It’s fair to say that Zero Hedge’s success has given Ivandjiiski a newly minted sense of his own importance. In conversations with reporters, he regularly touts his influence with political figures like Schumer and Senator Ted Kaufman of Delaware, whose aides, he says, call him all the time. Hempton also says he was among the first to raise the question of “who the hell Zero Hedge is—and what his dollar on the chit is.” Which is to say, what’s his agenda? Ivandjiiski was initially enthusiastic about being interviewed for this story and considered confirming his real identity, then backed out, citing the objection of a Chicago-based partner, who used to blog at Dealbreaker under the pseudonym “Equity Private.” She now calls herself “Marla Singer,” another character from Fight Club. She feared Ivandjiiski’s exposure would lead to her unmasking as well. But more important, he made clear, a measure of secrecy is essential to the site’s mission as an incorruptible critic of the market. Ivandjiiski did arrange for me to speak with Singer. It was a bizarre exchange. “Tyler Durden isn’t one person,” she said, but up to 40 different people allowed to post under that name. “We are all Tyler Durden,” Singer claimed. When John Carney of Clusterstock merely posted about a blogger named John Jansen, who had called a Zero Hedge post “egregiously incorrect,” Clusterstock was invaded by Zero Hedge fans who said he had “sold out to CNBC.” “Start a war with ZH at your own peril,” one of them warned. Wall Street is about speculation, and Wall Street blogs are no different. At this point, Zero Hedge has staked everything on a doomsday scenario, a takedown of the old order, “a deleveraging at every level of modern society.” Even as the market has improved, the economy has shown glimmers of stability, and many of his fellow bears have capitulated, Ivandjiiski has clung ever more tightly to his convictions. The manipulation of the market will eventually fail, he believes, and the pyramid scheme will be exposed for all to see. But it better happen soon or Zero Hedge may lose its mojo. The higher the Dow Jones climbs, the more righteous he necessarily becomes: Every hopeful data point a fraud, every bull a conspirator. There’s an old Wall Street term for this, for when you hold firm to your belief in defiance of the market—fighting the tape. It’s considered inadvisable, but that’s what Ivandjiiski is doing, convinced that he is destined to win. A few of the more prominent financial bloggers. Barry Ritholtz was a pioneer when he launched the Big Picture in 2003 using the beta version of blogging software, Word Press. He’s a levelheaded bear with a knack for seeing through the statistical fog of economic data, and wrote a well-received book, Bailout Nation. Naked Capitalism’s Yves Smith had worked at Goldman Sachs before she started blogging in 2006, distinguishing herself with a facility for deconstructing complicated economics. She is writing a book called Econned, about the flawed ideas that led to the crash. Felix Salmon had a stint blogging for famously bearish NYU economist Nouriel Roubini before he moved to Reuters. A serial skeptic of skeptics, he famously launched an assult on Ben Stein’s conflicts of interest as a columnist for the Times, which led to Stein’s departure. Bess Levin’s posts at Dealbreaker, the de facto “Page Six” of Wall Street, are as much about snark as finance, but her devoted following inside mainstream Wall Street firms has enabled her to beat The Wall Street Journal on a story or two.